Figure 2.6 Markings on rifle cartridge case due to fluted chamber. Figure 2.7 (a) Base of unfired full metal-jacketed bullet with exposed lead core. (b) Pitting of base of similar bullet due to ball powder. 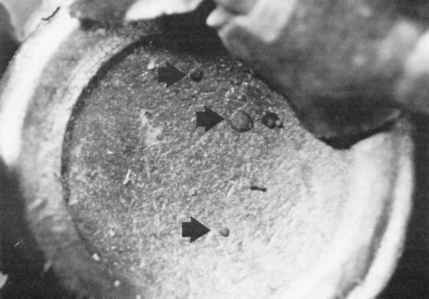 (c) Circular and linear marks on base of lead bullet due to disk powder. (d) Peppered appearing base of lead bullet due to black powder. bullets whose lead core is exposed at the base. The shorter the barrel, the more numerous and the deeper the powder marks.5 Different forms of powder produce different marks: spherical (true) ball powder produces numerous deep circular pits; disk powder produces shallow, circular imprints as well as linear markings (powder flakes striking on edge); black powder produces a characteristic peppered appearance (Figure 2.7). Powder marks are more prominent on the exposed lead base of full metal-jacketed bullets than on the base of all lead bullets. 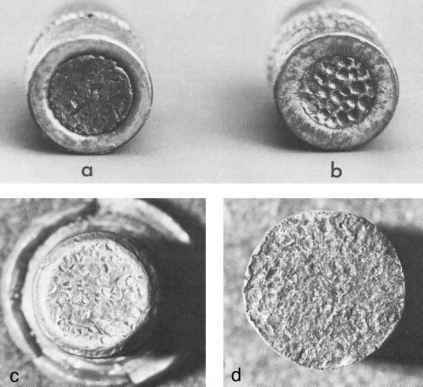 Bullets with a jacketed base (partial metal-jacketed bullets) may show very faint powder markings on the base. Powder grains may become adherent to the base of a bullet and be carried into and even through a body. This usually involves bullets with a lead base though on occasions this has been seen in a bullet with a jacketed base (Figure 2.8). Figure 2.8 Powder adherent to base of full metal-jacketed .357 Magnum bullet.